The photos below the inspiration for my four new stencil designs coming out on May 12, for Stencil Girl Products. Three of them are from travels: one from Turkey and two from Vietnam. The fourth is taken from my artwork. They are all 6 x 6 inches square. Turkish Wedged Stone (S370) is from a photo taken on a hike in Cappadocia. We saw many ruins containing lots of stone inlays. I thought these cylindrical shapes alongside the rectangular ones were great composition. See the actual stencil or purchase at Stencil Girl. 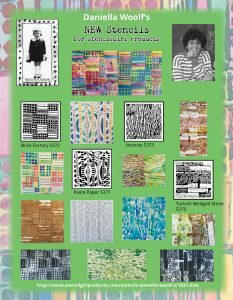 Paste Paper (S371) is a compilation of lengths cut out of several paste papers that I reconfigured. I think it makes a great stencil! See the actual stencil or purchase at Stencil Girl. of a wall of stacked bricks at a Brick Factory. See the stencil or purchase at Stencil Girl. See the stencil and purchase at Stencil Girl. Follow my travels on FB, and images under the name Dotty Stripes on Instagram.